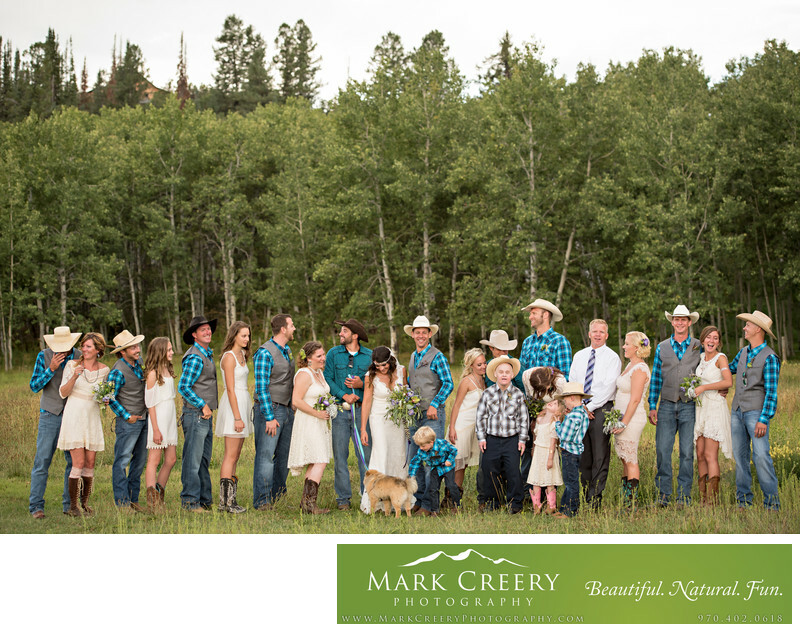 Piney River Ranch exemplifies what having an outdoor wedding is all about. The gorgeous mountain views of the Gore Range, the pristine lake, and an active guest ranch for partaking in the many possible activities are some of the great features of this venue. Guests can go horseback riding, hiking, canoeing, fly-fishing or just chill at the ranch. It's always a bonus when guests can party hard and then retire to their accommodation on-site. The venue can hold up to 200 guests, and the wedding ceremony takes place on the deck overlooking the lake. There's not much more you could want in a wedding venue. This photo shows a large bridal party of 23 people, including junior bridesmaids and groomsen, having a good time in front of a row of aspen trees. I love the variety of expressions as they look around and interact in fun and surprising ways. The couple's Pomeranian dog made a nice distraction for the little boy. This was a boho themed wedding with a rustic cowboy flair. The bridesmaids all had vintage dresses and cowboy boots which played nicely off the colorful plaid shirts and cowboy hats of the groomsmen. Piney River Ranch is located in Vail, Colorado. Contact: (303) 905-4439, events@pineyriverranch.com. Location: 700 Red Sandstone Rd, Vail, CO 81657.